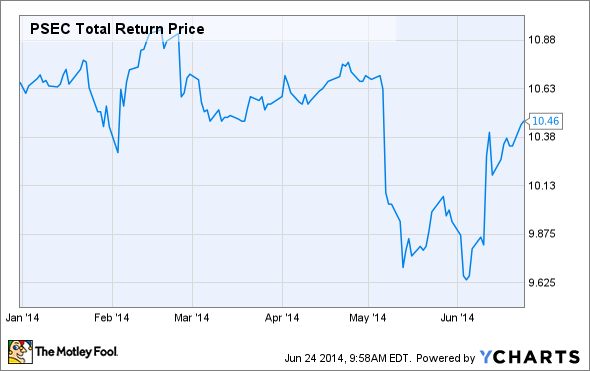 There has been a lot of drama involving Prospect Capital Corp. so far in 2014. What can we expect for the rest of the year? Prospect Capital Corporation's (NASDAQ:PSEC) shareholders have had quite a roller coaster ride so far in 2014. From the shares being removed from S&P and Russell indices to battles with the SEC over accounting procedures, this year have been a challenging time for Prospect and other business development companies (BDCs) in general. In fact, Prospect's total return for the year is -2%, which means even after the excellent dividends paid out, investors are still in the red for 2014. Will the decline continue, or is this an opportunity to get in cheap? First, the S&P and Russell indices decided in March to remove BDCs from their indices, which created a ton of selling pressure on the companies. Index funds which have held shares of Prospect are now forced to sell those shares, and simple supply and demand tells us an excess of sellers creates downside pressure. The index rebalancing is expected to be completed by the end of June, so this won't be a concern for much longer. Next, Prospect announced during its last earnings release it had been in talks with the SEC about the possible need to consolidate some of its holding companies for accounting purposes. This caused lots of speculation about how it could affect the company's past and future earnings, as well as Prospect's ability to maintain its dividend. Even though Prospect reassured shareholders in a press release that there would be no negative effects to the company's taxable income regardless of the outcome, it didn't stop at least five law firms from threatening class action suits against the company for "misleading investors" and "misrepresenting" financial data. While these lawsuits likely wouldn't have had much merit regardless, the wind was really taken out of their sails when the SEC decided no changes to Prospect's past financial results would be necessary. In between the index removal and SEC issues, Prospect announced two separate increases in its credit line usage, bringing the total to $857.8 million of the $1 billion revolving credit facility. Some investors might be nervous that Prospect's credit line is nearly "maxed out", but I actually have the opposite opinion. What Prospect is good at is borrowing money and lending it out at a higher rate. More borrowing just lets the company do more of what it does best. The critical number to watch here is $10.68. That is Prospect's net asset value, so as long as it trades below that price, you can actually buy shares of Prospect for less than the underlying assets are worth. Prospect usually trades for between 1.025 and 1.125 times its net asset value, so at the current price Prospect looks like a steal. And, while you wait for the share price to rebound you'll be paid a dividend yield of nearly 13% while you wait.